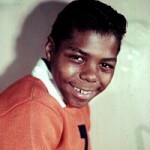 September 30, 1942 Franklin Joseph “Frankie” Lymon, R&B singer and songwriter, was born in Harlem, New York. At the age of 12, Lymon began singing in a group that called itself both The Ermines and The Premiers. In 1955, they wrote the song “Why Do Fools Fall in Love.” On the day of recording, the original lead singer was late so Lymon stepped in and sang the lead. The song became their first hit, topping the Billboard R&B singles chart for five weeks. Over the next year or so five other top ten singles followed, including “I Want You to Be My Girl” and “The ABC’s of Love.” The group’s last single, recorded in 1957, was “Goody Goody.” After that Lymon went solo, but was not nearly as successful as he was with the group. On February 27, 1968, he was found dead from a heroin overdose.